NEW YORK -- The days of toys and games that set the rules and told kids what to do are long gone. Now there is a new wave of smart, high-tech toys, games and apps that children can program themselves and be the controllers. The aim is to help kids get a head start at learning and liking STEM, which stands for science, technology, engineering and mathematics. "We're letting the child be the producer and the programmer ... rather than when I was young just sitting there passively. And the learning theorists would say active children learn more than passive children," said Warren Bucklietner, editor at Children's Technology Review. Many of the games and toys on display at this week's Digital Kids Conference in New York have been created to get kids more engaged and excited about computer science - skills that could pay off years later when it's time to join the competitive high-tech workforce. 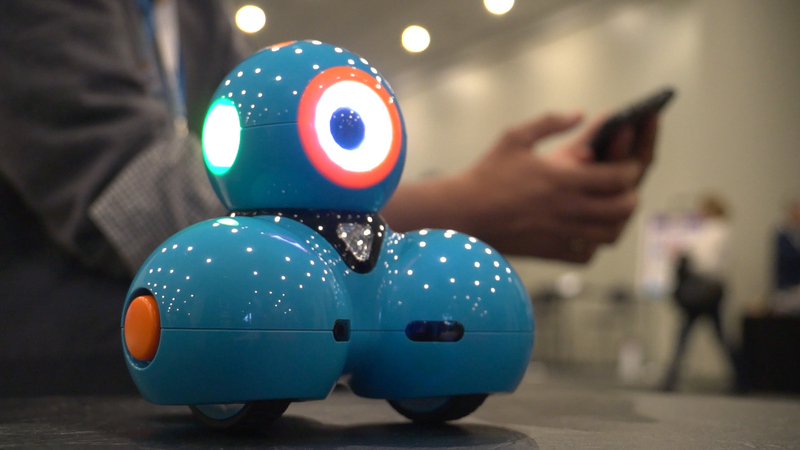 Toy robots like Dash and Dot give the child the opportunity to program how the robot moves. Vikas Gupta, one of the founders and CEO of Wonder Workshop, which created the robots, said toys that introduce computer coding and robotics to kids at a young age could have many benefits. "As a nation we are falling far behind in how much children are learning computer science and coding in our schools as opposed to most countries in the world," said Gupta. Gupta said technology now allows parents and kids to take charge of their education outside of school. And parents are taking note. A survey by BSM Media and Digital Kids Media found that 65 percent of parents say they would pay more for a smart, connected toy - specifically toys that help promote STEM - versus a traditional toy. Juniper Research estimated that this smart, connected toy market would hit $2.8 billion by the end of 2015. The market includes mobile games like Nancy Drew: Codes & Clues, created by HER Interactive, coming out in the spring of 2016. This game is especially aimed at getting more young girls to learn the fundamentals coding. "Girls, particularly in this age group of 5 to 8 years old, they are interested in coding or learning the basics of coding if there is a mission, if there is a purpose," HER Interactive CEO Penny Milliken told CBS News. That's why Nancy Drew solving mysteries was a perfect fit, she said. Milliken believes that the skills developed around these kinds of mobile games and toys are going to be a lot more common and essential as these kids grow up. "Coding is going to be like reading, writing, arithmetic - just a necessary skill for the 21st century," she said. While these toys, games and apps make educational promises, parents may still be wary of the lure of too many hours spent with screens and gadgets. Experts say it's important that the time kids spend with tech toys is spent wisely. "We can enrich child's play with technology or we can diminish children's childhood with technology - it's our choice," said Bucklietner.